I’ve been following the NBA playoffs and have heard announcers talking about one team sweeping another. What does that mean? When one team wins all of its games against another team in a particular set of games, it is said to have swept the other team. The reason you’re hearing it so much now is that the NBA playoffs are organized into best four out of seven series. For a team to move on to the next round of the playoffs, it must beat its opponent four times within those seven games. If it were a set of three games instead of seven, a team would have to win a majority of two out of the three to win the series. If a team gets to having won a majority of the games in a series by winning consecutive games, they have swept the series. You’ll hear talk about sweeps most often in sports that organize their games like basketball does. The NHL and MLB playoffs also are organized around seven game series. In the NFL, where the playoffs are single elimination, you may still hear someone talk about a team sweeping a “season series ” against another team. This means the team won all (usually it is just two) games against a particular opponent even if the games were not consecutive. Being swept is seen as humiliating in professional sports and players are determined not to let it happen to them. It’s actually fairly common though — as of 2009, 18% of NHL playoff series ended in a sweep. In this NBA playoffs so far, there are four teams at risk for being swept: the Celtics by the Knicks, the Bucks by the Heat, the Lakers by the Spurs, and the Rockets by the Thunder. If you’re having trouble remembering what a sweep is, here are two possible derivations that might help. One possibility is that the usage comes from the image of using a broom to sweep your opponent out of the way — that opponent put up so little fight that you could use the broom instead of having to pull a mop out or get on your hands and knees to scrub. Another possibility is that this usage shares a derivation with the word sweepstakes — a contest where one party sweeps all of the possible winnings into their lap — the image of one of those miniature shuffleboard sticks that roulette dealers use comes to mind. Author Ezra FischerPosted on April 28, 2013 Categories Baseball, Basketball, Hockey, Understanding SportsTags all sports, baseball, basketball, football, hockey, mlb, nba, nfl, nhl, playoffsLeave a comment on What is a Sweep? Why do People Like Hockey? So, the NHL is back from it’s most recent labor issues. My housemate is very excited. I’m not. Hockey leaves me uninterested in a way other sports don’t. What am I missing? Why do people like hockey? Thanks for your question. I happen to love hockey more than any sport I never played seriously. Here are seven reasons why I love hockey, why I think most hockey fans like hockey, and why you might like it too if you want to and you stick with it for a few weeks. You can see the puck — in the old days this was the number one objection for dubious and myopic hockey haters. “You can’t even see the puck!” they would say. And, to give them some credit, it was hard to see the puck on a small standard def television. In fact, this problem was taken so seriously that for one season Fox put a computer chip into the puck so that they could add a glowing halo and a comet trail to their hockey broadcasts in real time! This was pretty terrible. Now, HD TVs have solved this problem — you can see the puck! At least almost all of the time! The Stanley Cup — the Stanley Cup is the championship trophy for hockey. It is old and enormous and shiny and it has great traditions that go with it. As a matter of principle, no hockey player will touch the trophy unless their team just won it. When a team wins it, one player, usually the captain, will lift the trophy above their head, (no small feat, it’s three feet long and 35 pounds,) kiss it, skate around a bit, and pass it to one of their teammates who will do the same until all have had a turn. During the summer after they win it, each player gets a day with the cup. They can take it to their home town, take it to their favorite vacation spot, to visit a hospital, or a bar… they drink champagne from it or eat cereal. Some have slept with it in their beds. The Playoff Beard — I’ve written about the playoff beardbefore but suffice it to say that watching a hockey team you root for get hairier and hairier is an oddly satisfying part of a successful playoff run. 45 seconds — Hockey players generally play between 30 seconds to a minute at a time before they hop over the boards back to their bench and are replaced by a teammate. These short bursts of activity are called shifts and they are the source of many of the elements that make hockey unique and enjoyable. Because players play in such short bursts, they can go all out when they are on the ice. It also contributes to the hockey ethic of playing through injuries. All sports have this to some extent, but hockey players take it to an impressive extreme. I think part of this is that you can grit your way through injuries for 45 second bursts that you wouldn’t even think about trying to play with if you were playing 90 minutes like in soccer or 35 like in basketball. Watching teams change lines (groups of players who usually play together) is the easiest “advanced” thing to watch in hockey because goals are often scored against a team who is unable to change switch their players out and get stuck with tired guys on the ice or who try to sub at a bad time and are stuck with people not in the right position. It makes you go “aaaahhH!” — I watch a lot of sports and none make me squeal as much as hockey. It’s so fast, so suddenly desperate, so chaotic that it always finds a way to surprise. Whether it’s the power of a long shot that hits the back of the net at 90+ miles per hour, an open ice body check that sends someone flying, or a scramble of six or more guys in front of the net desperately trying to score/prevent the other guy from scoring, hockey will almost always find a way to surprise and delight. Grace — This absolutely is hockey playing against type, but it’s nonetheless true. Think a little bit about what’s going on when you watch a hockey game: ten guys wearing armor and holding spears are moving around at 20 miles per hour with razor sharp knives on their boots. The goal is to get a tiny little piece of vulcanized rubber into a net and to do this they pass the puck back and forth, do all sorts of fancy footwork and stick-handling, and shoot with surprising accuracy, all while the other team is taking every opportunity to physically knock them off their feet. There’s an amazing amount of skill, strength, and grace involved in every hockey game. Blood (and Consent) — Okay, yes. There’s also a lot of violence. There’s no way that I can do this subject justice. The New York Times’ three part story about Derek Boogaard is an amazing and disturbing read. What I can say is this — if we are okay as a society with violent sports (football, MMA, boxing, horse racing,) I think hockey does it about as well as it could be done. There are surprisingly few violent hits to the head. Compared to football, it’s no contest — the fluidity of the sport ensures that most contact is body to body. And fighting, always a controversial topic, is done in as controlled and ritualized way as possible. This is not to say that sometimes fists aren’t thrown in anger, but most of the time it happens more like the way Tanner Glass described his fight from a day or two ago in the New York Times. And believe it or not, when these guys are done with a fight (as soon as one of them looses his footing or is otherwise at a clear disadvantage,) they will often congratulate each other on a job well done. It’s bizarre to outsiders like me but because players are sometimes miked for television, I’ve actually heard it before. So there you have it Mitch, seven reasons why people like hockey. I hope one or a few of these connect with you enough to give it a shot or at least to understand what your housemates are excited about! Author Ezra FischerPosted on January 22, 2013 Categories Hockey, Understanding SportsTags hockey, nhl2 Comments on Why do People Like Hockey? Do Home Teams Wear White? Why? Speaking of my teams colors. can you explain the color choices and jersey choices that teams have. I know there are home jerseys and away jerseys. What are third jerseys? What about when two teams play at home (Gians v. jets)? This is something I’ve been wondering about for years! I swear that when I was a kid the home team used to wear white. Now they seem to wear their team color and the road team usually wears white. Arghh — it’s been driving me crazy! Thanks to your question, I did a little research and I think that I can explain it. It’s a little confusing, but there are arguments/explanations for both systems. For example — the road team wears darker colors because once upon a time they might not have had access to laundry between games and the darker colors hid the stains better. Or — home teams wear light jerseys because dark jerseys attract the sun which is a competitive disadvantage. Or — (and this is where your third jersey explanation comes in) the road teams wear white so that the home team can use its third jersey. A third jersey is usually another colored jersey that is either futuristic or a throw-back to a previous color scheme/design that a team will wear strategically to sell more merchandise to its fans. Some sports have requirements about when or how much teams can use this third jersey. Back in my (old)hockey/soccer days I always thought the color scheme came down to a question of identification. Everyone knows who the home team is because it’s the home team! So it’s okay for them to wear white. The color of the road team helps the home fans to know who they are playing against. Later in my football/(new)hockey days I thought it was a subjugation thing — the home team gets to peacock around in its finest colored plumage while the road team is forced to look just like everyone else in white. When there are two “home teams” like in the case of Jets v. Giants or Lakers v. Clippers, the league will designate one of the teams as “home” and one as “away.” Jersey colors, season tickets, and other stuff follows from that. What really bugs me is that home teams during the NHL playoffs will often do a “white-out” where all their fans get free white t-shirts. This is supposed to be intimidating? To a road team that’s wearing white? Arhg!!! In case this hasn’t been enough dorky conversation about team colors, check out these guys at ColorWerx™ (formerly The Society for Sports Uniforms Research.™) Whoa! Author Ezra FischerPosted on August 4, 2011 Categories Baseball, Basketball, Football, General Sports, Hockey, Understanding SportsTags baseball, basketball, clothing, football, hockey14 Comments on Do Home Teams Wear White? Why? Reading about the bad call in the Pittsburgh/Atlanta game last night reminded me of something I’ve always wondered. Whether it’s because the ref is looking the other way (literally or figuratively), or because of just plain human error, the rules in sports are often either not enforced, or not enforced correctly. But in many cases, it seems like people just consider that an integral part of the game! Especially given the increasing ability of technology to settle disputes, why not just come up with what the real rules ought to be, and then enforce them as thoroughly as possible? There is some concern that adding technology to sports will ruin the game by making it too sterile or too slow. Taking the humanity out of the game could be a concern, but as much as people love discussing disputed calls at the water cooler, they also love talking about great (and terrible) performances, and great (and terrible) decisions on the part of the players and coaches. There will always be something to talk about. As for making the game too slow… uh… it could not possibly slow down the game as much as television time-outs, arguing with refs about calls, or in the case of baseball… adjusting your batting gloves, hat, glove, or cup compulsively over and over and over again. FIFA, the notoriously frustrating international federation of soccer refuses to add video replay to international competition because it would be too expensive for some of its member nations to implement. This is a curious reason since it seems like knowing ahead of time that you will actually know whether the ball crossed the goal line during the game shouldn’t change any element of tactics or strategy. Sports, particularly baseball is all about cheating. The last twenty years have been shaped by steroids and HGH. Before that there were amphetamines called greenies. Before that teams regularly intimidated officials or just plain assaulted them when they didn’t like the calls they were getting. It’s well know that the 1919 World Series was fixed by a few players on the White Sox and there have always been unproven rumors that the 1918 one might have been fixed as well. Cyclists are jam-packed full of drugs. They have been for a long time but “tiny electric motors…?” That’s a new one. Even if a player is clean when he steps onto the court, he or she is rarely clean by the end of the game. Some of the most memorable plays in sports history have been the beneficiaries of some incorrect or missed calls. In soccer there is the “hand of god” goal, in basketball, Michael Jordan’s famous shot to beat the Utah Jazz is an offensive foul. Watch the video and notice Jordan’s left hand on his defender’s hip… he definitely pushes off. Jordan is not great in spite of pushing off, he’s great partially because he pushed off and didn’t get caught. Another way to state the question is — do we really want to have the game called “perfectly?” Here’s an example of this in the non-sports world. We certainly have the technology to identify each car and driver and what road they are on. Why shouldn’t we simply fine people whenever they go over the speed limit? Why waste all the time, money, and talent of our police departments lurking around trying to catch people when we could just automate it? I know we’ve started doing this with running some red lights, but I think that if we tried to automate speeding tickets on a large scale there would be riots and political parties would shape up around the issue… and I’m not sure which would be worse! It’s the same with most sports — a totally policed game is a boring one. Why Aren't the Rules the Rules? Great question! In fact, this is such an interesting question that I’m going to break my answer into a couple blog posts. Sports rules are complicated and the action happens very, very quickly. Assuming that there is no way that we’re going to be able to rework the rules to change something as integral as “if the catcher has the ball in his glove and touches the runner before he touches home plate, he’s out” then one has to wonder how technology will help. Setting aside video replay for a second, let’s look for another solution. Okay, so — let’s put a chip in the ball. Then, let’s put some material in the catcher’s glove such that the ball knows when it’s in the glove. Great — now we’re cooking with gas! Now we have to have either more material covering the runner’s uniform… and hands, arms, head, neck, etc. Or, I guess we could just monitor whether the glove is making contact by putting some sort of pressure meeter into the ball or glove. Except that won’t work because that glove could hit the ground, the ump, or the catcher’s own body. I’m not sure any of this will work, so let’s go back and examine video replay. Video replay is the most common form of technology in sports. Football, basketball, hockey, even baseball (believe it or not) have some form of video replay in their rules. In baseball use of video replay is restricted to basically deciding whether a ball was a home run or whether it never left the ball-park, did leave but was subject to fan interference, or left but was foul (too far off to the side to count.) Other sports have more extensive video replay rules. You may have noticed NFL coaches comically struggling to get a little red flag out of their sock, pants, shirt, etc. and throw it onto the field — they are “challenging” the ref’s judgement and calling for a video replay. Every goal in hockey is reviewed by a team of video officials in Toronto. The NBA has been able to replay shots at the end of quarters and games and just recently added video replay for unclear out-of-bounds calls. Tennis has a system called Hawkeye. This is probably as close as it gets to your suggestion. According to Wikipedia, “all Hawk-Eye systems are based on the principles of triangulation using the visual images and timing data provided by at least four high-speed video cameras located at different locations and angles around the area of play.” In tennis the rules are objective and there is technology which insures the calls are too. Or at least can be. The computer has not totally replaced the line-judges or the referee yet… although I could see a time in the not so distant future where they could. If you want to use replay to make a simple yes or no call, you won’t get unanimity. And no, the fact that Lugo acted as if he were out does not constitute iron-clad proof. Watch the replay for yourself, with the sound off. Either way, replay wouldn’t have resolved the issue. 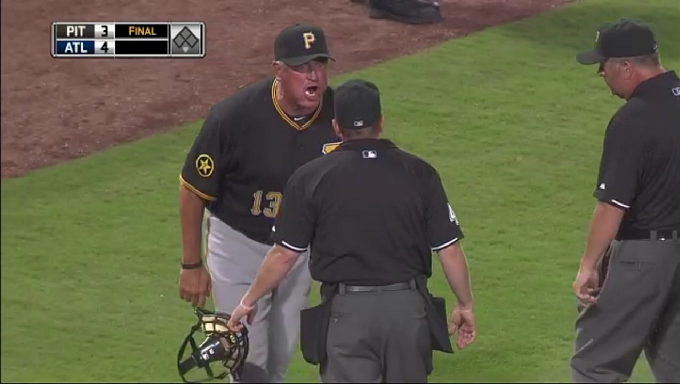 Not to the point where all parties, including a purple Clint Hurdle, would have been satisfied. And, as Keri also points out, at the time of this call, the ump had been on the field working in a high-pressure environment for six hours and 39 minutes. Furthermore — even Baseball is a nice tidy game compared to Hockey or Football. No matter how many cameras, sensors, and computers you have, there is no chance in hell you’ll be able to figure out what happened at the bottom of a pile with thousands of pounds of angry football player fighting over the ball. Author Ezra FischerPosted on August 1, 2011 Categories Baseball, Basketball, Football, General Sports, Hockey, Other Sports, Soccer, Tennis, Understanding SportsTags baseball, basketball, cycling, drugs, football, fouls, hockey, nba, nfl, nhl, rules, tennis5 Comments on Why Aren't the Rules the Rules? Why do Baseball Players Wear Belts? Baseball, to a degree not seen in other sports, is grounded in traditions that have been around for over a hundred years. To us, and even to the players, some of the traditions make no sense – but because baseball is perceived, or wants to be perceived, as “America’s game,” something that’s unchanging and consistent throughout history, the traditions remain. Which is a roundabout way of saying there’s no good explanation for why baseball players do a lot of things and you can just add this one to the list. When you think about baseball players’ attire, they’re actually more appropriately dressed up to go out to the club than they are to play a professional sport. Their shirt is actually a button-down, unlike every other major professional sport, where they wear jerseys of some sort. The players are given a sartorial choice when it comes to their socks: some pull their pants all the way down to their cleats, some have their socks meet their pants at the knee like an 18th century landowner. So there’s an element of (attempted) style to the baseball uniform that speaks to how the sport sees, or saw, itself. Basketball: Teenager. Easiest of the bunch. Tank top with long baggy shorts and sneakers. I just described half of the teenagers in America. Headwear: Some players wear headbands by personal choice – the only one of the major sports where headwear is optional, come to think of it. Football: 80’s . When you come right down to it, football players are wearing cut-off tee shirts and (long) cut-off shorts – two regrettable legacies of the 80’s. Among many. Hockey: Yuppies. Hockey players wear sweaters. ‘Nuff said. Baseball: Yuppie. As discussed above, it’s a button-down tucked into long pants, complemented with a nice belt. Equally at home on the baseball diamond or at happy hour. Golf: European yuppies. The collared shirts, the tight fitted pants, the visors – throw some sweaters around these guys’ shoulders and they could be on a yacht docked somewhere off the Riviera. NASCAR: Dr. Evil’s evil henchmen. The jumpsuit is worn by everyone on the team. The driver gets a dark, tinted helmet. If Dr. Evil was sponsored by Home Depot, this is how his minions would dress. Author Ezra FischerPosted on July 26, 2011 Categories Baseball, Understanding SportsTags baseball, basketball, football, hockey, NASCAR, nba, nfl, nhl, racing, style2 Comments on Why do Baseball Players Wear Belts? Why do Sports Have Seasons? Why are sports played during certain seasons? That’s an interesting question. Oddly enough I could find barely any answer for your question online. So… I’ll just have to make up an answer. Sports seasons once made sense because the weather fit the sport. Football was played in the fall because it’s best played on cool, crisp autumn days. Playing football in the summer would be tortuous and dangerous for players running around in what basically amounted to heavy leather armor. Baseball cannot be played in the winter and because the season is so long and games have to be canceled on even the hint of rain, it’s important to get started as soon as spring begins to spring. Hockey is played on ice so… winter seems like a natural time for it especially in the days before super-powerful air-conditioners made it feasible to play hockey in South Florida and Texas. Since real Americans don’t play hockey, they needed something else to play in the winter. Enter Basketball, a sport that could be played in the summer but could be played in the winter! Everything made some sort of intuitive sense until serious money got injected into sports leagues. With few exceptions, the more games a league scheduled, the longer the season, the more teams made the playoffs and the longer the playoffs were, the more money owners and players and television stations could make. This is where things started getting mushy. In 1960, when the NFL began it had a 12 game regular season. The next year they expanded to 14 games which lasted until 1978 when they added another 2 games. It’s been that way since then although they are now discussing moving to an 18 game season as part of the lockout negotiations. The first Super Bowl was held on Jan 15, 1967. This year’s Super Bowl was on February 6! Similar transformations have happened in the NBA and the NHL. The first NBA championship was on April 22, 1947. The Philadelphia Warriors beat the Chicago Stags. This year’s NBA championship ended on Sunday June 12! The NHL is not far behind. Actually it’s ahead. This year the NHL Finals ended on June 15. That’s not hockey weather!! The first NHL championship was back in 1893 and I can’t figure out the date, but the first modern championship ended on April 19. As for Baseball — the World Series has shifted from October 13 in 1903 to November 1. Author Ezra FischerPosted on July 11, 2011 Categories Baseball, Basketball, Football, General Sports, Hockey, Understanding SportsTags baseball, basketball, football, hockey1 Comment on Why do Sports Have Seasons?